With the nickname “man’s best girlfriend,” netizens and fans voiced out their concerns for 37-year-old Natalie Tong (唐詩詠) when she told the press that she is still single. The TV Queen announced her split with fellow actor Tony Hung (洪永城) in May 2017, and has remained single ever since. Tony, on the other hand, confirmed his relationship with model Inez Leong (梁諾妍) earlier this year. But in this new year of the pig, fans may not have to worry too much. 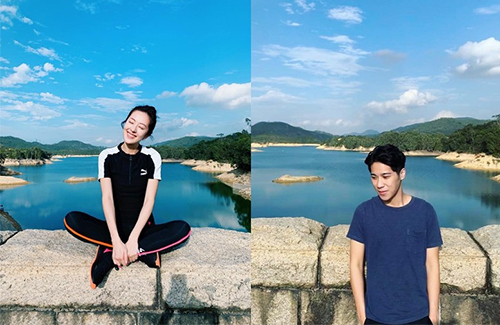 Interestingly, Natalie’s rumored boyfriend Samuel Chan (陳思銘) [not to be confused with actor Sammul Chan (陳鍵鋒)], known for his resemblance of singer Leehom Wang (王力宏), also shared on Instagram that he went on a hike. Though they did not mention each other on their posts, their followers noticed that their photos were taken at the same place. Samuel is 30 years old and is an education consultant. He has also written columns for various publications, and has conducted official interviews.